1) Arrival at Peking Airport, on US "Spirit of 76". Greeted by Zhou Enlai and others. Standing at attention while Chinese military band plays US and Chinese national anthems. Nixon and Zhou Enlai review paraded Chinese troops in greatcoats. (97 sound on film). 2) Black and white segment of Mao Tse Tung and Richard Nixon, handshaking. Zhou Enlai and Henry Kissinger. Big smiles. 16' sound on film, guide track. 3) Richard and Pat Nixon enter Great Hall with Mao Tse Tung's wife Jiang Qing for ballet performances. Seen taking seats. Dramatic performance of a revolutionary theme, ballerina quivering on her toes, her cheek to the red flag. Applause. Nixon and audience at end. (100' sound on film including ABC commentary). 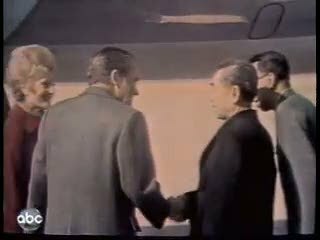 Chicago: “American Experience; Nixon; Nixon in China, 1972 [Part 1 of 2],” 02/01/1972, WGBH Media Library & Archives, accessed April 26, 2019, http://openvault.wgbh.org/catalog/V_0B073D25194442BD9963EB1BCF25A5D1. MLA: “American Experience; Nixon; Nixon in China, 1972 [Part 1 of 2].” 02/01/1972. WGBH Media Library & Archives. Web. April 26, 2019. <http://openvault.wgbh.org/catalog/V_0B073D25194442BD9963EB1BCF25A5D1>.